Characters bump up against history and each other’s sharp edges in this thrilling, deftly related novel. 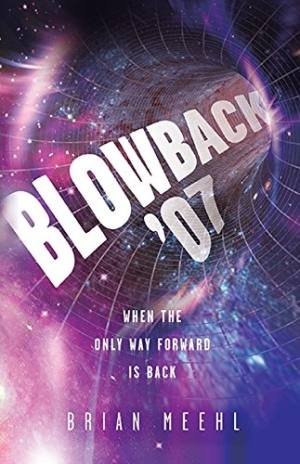 Brian Meehl’s Blowback ’07 is a compelling young-adult time-travel adventure that vividly portrays the overlooked history of modern American football. This gripping story infuses history with humanity, not just in its depiction of football as a noble game, but in its resurrection of those who played and shaped it. Two Midwestern teenagers, Arky and Iris Jongler-Jinks, are trying to heal from their mother’s unexplained disappearance a year before, while also navigating the everyday obstacles of eleventh grade. When Arky decides to take advantage of his father’s weekend trip and invites his best friends and the rest of the high-school football team over for a postgame party, Iris protests by retreating to her room to practice her oboe. Little does Arky know, Iris is actually playing the Jongler family cor anglais, an heirloom that appeared on her bed with a note from her mother the day of her disappearance. When Arky’s drunk friend Matt Grunnell interrupts Iris and insists she play for him, the music takes over and Matt disappears, leaving Iris with no idea of his fate. Matt soon discovers he’s arrived in the Carlisle, Pennsylvania of 1907, where another Jongler named Alfred finds him. Alfred also possesses the family cor anglais, but until Alfred decides what to do, Matt must enroll at the Carlisle Indian Industrial School and lay low. Stuck biding his time, Matt tries to do what he’s good at—football. But he has a lot to learn about the game Pop Warner and the Carlisle Indians football team are playing. Arky and Iris’s experience races beat-for-beat with as much excitement as Matt’s. The drama of their mother’s disappearance makes for rich material, and the twins’ differences are displayed in zinging, often hilarious dialogue. As the twins race for answers in the present time, Matt’s journey into history reveals a world rich in well-rounded characters who struggle with issues of identity, race, passion, and simple maturation. Progressive Era attitudes shape the 1907 world, and Meehl doesn’t shy away from history’s facts. Matt experiences the violence and force of the Carlisle Indian Industrial School’s intervention, even as he is insulated from many of the physical and psychological tolls by virtue of his status on the football team, and the fact that he knows he’s not Native American or a permanent part of that time stream. However, Matt is a believable time voyager who acts as much like a teenager as the students around him. Collectively, the characters are allowed to behave in perfectly imperfect ways. These wholly relatable flaws, as much as Meehl’s fluid prose, make Carlisle Indian Industrial School’s history and inhabitants come to life. Reminiscent of Octavia Butler’s Kindred, Meehl’s deft characterization and gift for infusing historical facts with emotional depth and motivation makes for a consuming read. By allowing his characters to bump up against both history and each other’s sharp edges, Meehl’s world thrills in the first book of this promising new trilogy.